Originating from the Doodhatoli Ranges in the district of Pauri Garhwal, Uttarakhand, Ramganga River runs southwest from Kumaon Himalaya. Ramganga is a tributary of the Ganga River. The upper stream of this meandering river flows through the Corbett National Park and enhances the beauty of landscape manifold. 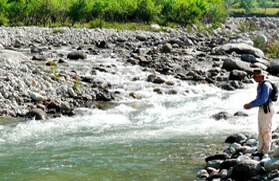 Other than augmenting the exquisiteness, Upper Ramganga also provides vast opportunity for fishing and angling. 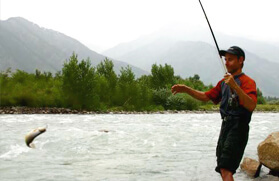 The angling fanatics can go for Mahseer, Goonch and Trout fishing in Upper Ramganga. If someone wants to enjoy fishing in Corbett National Park, there is a need of permission from the Divisional Forest Officer (DFO). 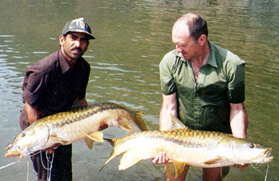 However, fishing in the regions other than those of Corbett doesn't require any prior permission. 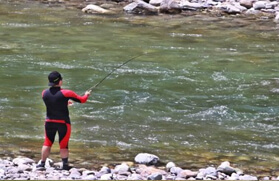 The buffs of fishing and angling can come to Upper Ramganga all the year round. However, October to mid June is considered as the best time for it, as the weather remains soothing and highly favourable to enjoy this recreational activity. If you are an aficionado of fishing and angling, this 10 Nights and 11 Days itinerary is designed scrupulously to fulfill your thirst for enjoying this leisure activity. The major destinations covered in the itinerary are Corbett, Ramganga, Vanghat, and Bhikyasen. The tourists who carry out angling in Upper Ramganga can tell you how great and gratifying the experience can be. 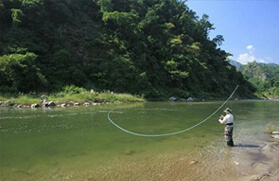 Angling in the midst of nature's loveliness is certainly an experience that is second to none. On arrival at Delhi International Airport, meet our representative who will be at the airport for your welcome and thereafter transfer to your already booked hotel in Delhi. Check in at the hotel. The rest of the day is free at leisure. During your leisure time you can explore the colourful streets of the city. Enjoy an overnight stay in the hotel. In the morning after breakfast, we will check out from the hotel and proceed on our road journey to Corbett Tiger Reserve. On arrival, check in at the forest rest house. The rest of the day is free at leisure. During your free time, you can take pleasure of the modern amenities that are offered by your forest rest house or simply explore the place and its surroundings. Take pleasure of a comfortable overnight stay at Forest Rest House. Established as the first national park of India in 1936, Corbett Tiger Reserve is named after a legendary British hunter Jim Corbett, who stand against the local people for killing tigers and become a leading voice for the protection of tigers. After breakfast in the morning, we will leave for our first fishing experience at the confluence of Mandal and Ramganga Rivers located in the Corbett Tiger Reserve. Here, we will enjoy fishing for the entire day and try our luck to catch as many as possible with the help of an experienced tour guide. Later, we will return back to the rest house for a relaxing overnight stay. Today again we will start our day with the healthy breakfast that will be served in the rest house and thereafter go for a dull day fishing tour at the confluence of Mandal and Ramganga Rivers. We will try to increase the count today with the help of a professional guide accompanying us for this day tour. Later, we will return back to the rest house to stay overnight. In the morning after breakfast, we will leave the rest house with our fishing equipment for practising our passion on the various pools in Ramganga River while moving upstream towards Jamur, where a safe and secure camp is set by our staff for a night stay. So, the day is fixed for enjoying fishing throughout the day followed by a night stay in tent/camp. We will start our day with a hot served breakfast in the camp and thereafter continue enjoying fishing in Ramganga River and make some lifetime memories. Enjoy dinner followed by an overnight stay in tents located near the river. After breakfast in the morning, we will leave for a full day fishing tour to various pools in Vanghat, which is a fishing location that will add on to your overall fishing experience. Thereafter, we will enjoy dinner and an overnight stay in tent/camp near Vanghat. Today after breakfast in the morning, we will leave from Vanghat by road to reach Bhikyasen. On reaching Bhikyasen, we will set up a camp. Afterwards, we will leave for fishing in various pools in the Upper Ramganga River, a favourable fishing and angling destination. Later in the evening, we will return back to our tent for an overnight stay. We will again go for fishing after breakfast in the morning, but this time we will opt for fishing in various beats of the Upper Ramganga River. This will surely enhance your existing fishing experience and help you in holding expertise in fishing techniques. Later, be back for an overnight stay in tents. In the morning after breakfast, we will experience fishing in the upper Ramganga River. Thereafter, in the afternoon, we will depart from Bhikyasen by surface for Corbett Tiger Reserve. On reaching Corbett, check in a lodge/camp for a relaxing overnight stay. On the last day of our tour after breakfast in the morning, we will depart from Corbett Tiger Reserve by surface to arrive Delhi. On arrival, our travel representative will directly transfer you to the airport to board the flight for onward destination.